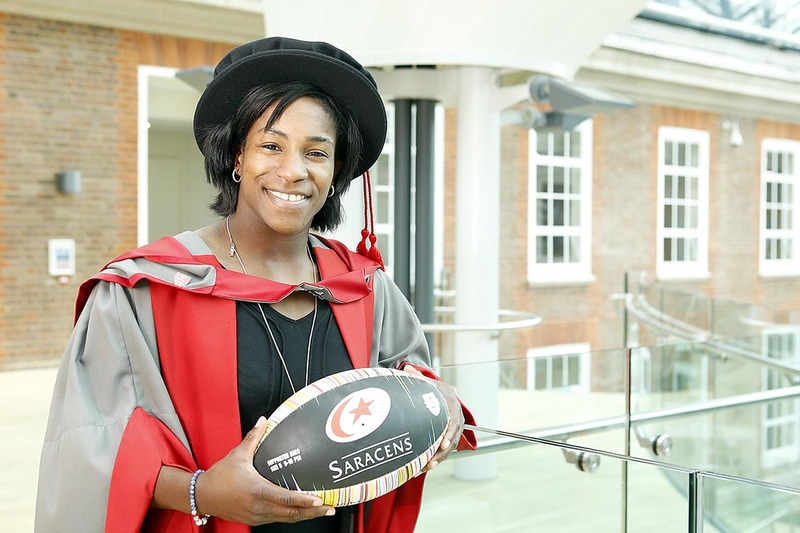 Former international women’s rugby player Margaret Alphonsi MBE has been awarded an honorary degree by Middlesex University. She was presented with the award at the University's graduation ceremony today on Thursday 16 July. Known by many as 'Maggie the Machine', Margaret has played in three XVs Rugby World Cups and last year she played a key part in the England team winning the World Cup. In 2012 she also shared in a record-breaking seventh successive Six Nations title and a sixth Grand Slam in seven years with the England team. Margaret, who was also a flanker for Saracens Rugby Club in north London, retired from rugby earlier this year with an impressive 74 caps. However, far from taking things easy she is now focusing her efforts in her bid to compete in the shot put at next year's Rio Olympics. All of her achievements are even more remarkable considering the experienced player was born with a club foot, but turned early adversity into an impressive career. Margaret's significant achievements and contributions have not gone unnoticed as she was awarded an MBE in the 2012 Queen's Birthday Honours List for Services to Rugby, which she described as 'incredible'. She has also picked up a number of other high-profile awards. She was awarded the esteemed Sunday Times Sportswoman of the Year prize in 2010 and the prestigious Pat Marshall award from the Rugby Union Writers' Club, where she pipped New Zealand captain, Richie McCaw, to the gong to become the first woman to claim the prize in its 50-year history. She was also named in the Powerlist for three years running, a highly respected publication which profiles 100 of the most influential people of African and African-Caribbean descent in Britain. The inspirational sportswoman continues to put her experience to good use as she coaches and promotes female participation in sport. She acts as an athlete mentor manager for the Youth Sport Trust and one of four Rugby World Cup 2015 Ambassadors along with Lawrence Dallaglio, Will Greenwood and Jonny Wilkinson. She is an ambassador of several charities including Wooden Spoon, Sporting Equals and SKRUM which aims to give the youth of Africa hope for the future through rugby. Margaret Alphonsi said:"I'm extremely pleased to be receiving an honorary degree from Middlesex University. I am very fortunate to have had an amazing career so to be recognised for my achievements by the university and to be able to address the other graduates really does mean a lot." Middlesex University Vice-Chancellor Professor Michael Driscoll said: "Margaret has overcome adversity from a young age to carve a remarkable career in English rugby and continues to inspire women of all ages. "Graduates, family and staff were honoured to welcome one of the country's star players to the University and present her with this truly deserved award."